The evolution of technology is sometimes cruel. A few years ago, we witnessed the birth of a new breed of small 10-inch Windows laptops called “netbooks.” These compact computers shunned processing power in favor of low price tags, portability, and better battery life, carrying older operating systems like Windows XP and running on Intel Atom processors. Sadly, their short time serving us may be ending. Tablets are taking their place. The touch tablet is evolving, and is already a viable netbook competitor. In the next few years, it will almost certainly take over the category entirely, becoming an accepted alternative to the Intel-based, Windows laptop or desktop you’ve known for the last decade and a half. Thanks to the incredibly fast growth of the smartphone market — which was sparked by the iPhone four years ago and fueled by an army of Android phones ever since — a new breed of computing devices called touch tablets have evolved. Based on the energy-efficient ARM architecture (think of ARM as the enemy of Intel chips) and lightweight operating systems (Android and iOS) that power smartphones, touch tablets began appearing on store shelves in the last year. The first of these devices were built in the image of their founder, the iPad, and tend to reflect its strengths and weaknesses. Most tablets sport price tags from $300 to $500, 7- to 10-inch touchscreens, amazing battery life of nine hours or better, working Web browsers, A/V playback, email, a sea of smartphone-like apps and games available to download, and the ability to stay powered and connected for days in stand-by mode. Sound amazing? Well, don’t get too excited yet. While the first batch of tablets show a lot of potential and are already quite useful at some tasks, they currently lack critical features needed for a full-scale invasion of the consumer PC market. Basically, touch tablets are great for consuming and entertainment, but they fail when it comes to getting work done. It’s easy to read email, but responding to it on a small touchscreen isn’t as fun. Despite their many advantages over Macs and Windows-based computers, productivity isn’t a friend of Android and iOS tablets. Not yet, at least. Things are already changing. The year 2011 has been host to a number of experiments at converting the smartphone into a laptop equivalent device. The Atrix was the first of these experiments. It was a great idea ruined by a botched execution. 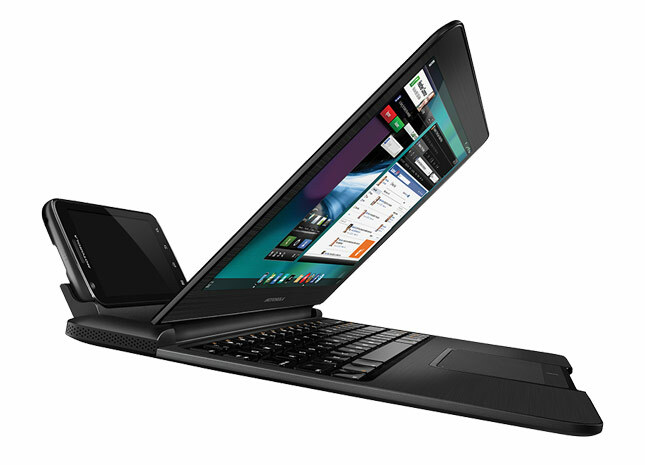 In January, Motorola unveiled the dual-core Atrix phone and laptop dock. The idea was that you could plug your phone into the back of a laptop shell and use your phone like a computer. The laptop dock’s built-in battery even charged your phone while you used it. Sadly, the concept wasn’t all there. While it looked great on the show floor, the final product suffered a number of fatal flaws. When it hit shelves in the spring, the laptop dock was far too expensive ($400) and because it used a custom operating system with very few, if any, apps available. The stock notebook came with a word processor and a copy of Firefox… that’s it. With a price tag higher than most netbooks, it just didn’t make sense to most people, and as a result, the Atrix and it’s laptop dock tanked on the market. However, with a new unified version of Android (codenamed: “Ice Cream Sandwich”) ready to be unveiled later this year, perhaps the Atrix was just a year too early. The new version of Android will be able to swap between tablet and phone resolutions on the fly, changing its design based on the size of your screen. If the Atrix laptop would have run on Honeycomb, it would have been a much more attractive purchase. Hopefully, manufactures don’t abandon the concept. Motorola was on to something there. Motorola also introduced the first Android Honeycomb tablet: the Xoom. Like most tablet makers, it chose to largely copy the design and functionality of the iPad. This strategy has been tough for all who’ve tried it. After all, who wants a tablet that’s as good as an iPad, when an iPad is cheaper or, at the very least, equal in price? That’s why Asus’ decision to make a different kind of tablet looks so smart, in hindsight. 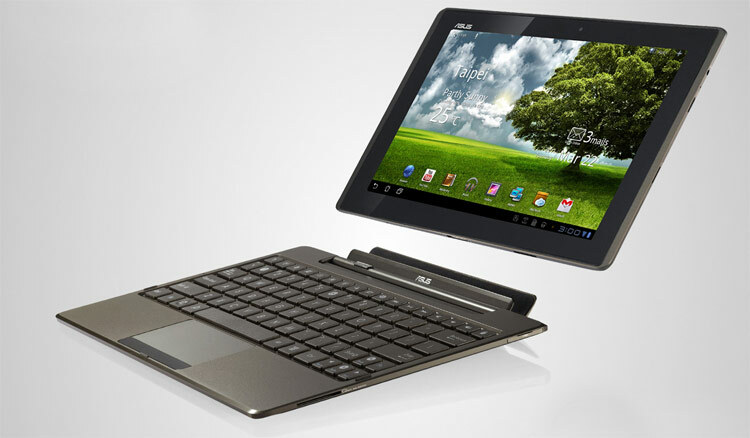 Asus saw a different future for tablets from the get go. In January, the company unveiled a line of 10.1-inch tablets that looked quite different from the competition, headlined by the Eee Pad Transformer and Eee Pad Slider. The Eee Pad Transformer is a 10.1-inch Android touch tablet with good specs and priced at a market-leading $300. Not only is the tablet cheap, it has a secret weapon: a $150 snap on keyboard that doubles the tablet’s battery life to an impressive 16 hours. It attempts to offer users the benefits of a netbook and a tablet. It has a touchscreen and can be used as a tablet when you want it, but that keyboard is handy when you want to get down to business. The Eee Pad Transformer didn’t get a lot of attention by us in the tech press at first, but it’s been selling out at retailers as fast as Asus can make it. While other tablet manufacturers, like Motorola and RIM, have been disappointed with sales of their first tablets this year, Asus has seen demand grow each month since the Eee Pad Transformer’s debut in April. A few weeks ago, Asus CEO Jonney Shih reported that the manufacturer sold 300,000 Transformers in June and 400,000 in July. The company will debut its Eee Pad Slider tablet, which has a slide-out-and-tilt-up keyboard, in September, and a sequel to its Transformer will be shown before year’s end. If rumors are true, the Transformer 2 will run on Android “Ice Cream Sandwich” and have a quad-core Nvidia Tegra 3 processor, essentially doubling the processing capabilities of the first Transformer. Assuming Asus delivers, 2012 could bring a bunch of new keyboarded competitors to the market, many of which we saw at CES this year, but never made it to U.S. store shelves in the months since. If there’s one thing that may spur the growth of tablet laptops, it will be Windows 8 (check out our guide). The OS is currently scheduled to hit shelves sometime between June and October 2012 and has been designed, from the ground up, with touch tablets in mind. Microsoft has seen the writing on the wall as Android and iPad tablet sales continue to eat into the netbook market, and it has no plans to give up its 85- to 90-percent share of the PC market. Windows 8 will be able to run on ARM processors and will have a completely redesigned interface that looks a lot like Windows Phone 7. Having said that, Microsoft is hedging its bets. Windows 8 does have a crazy new interface, but for those craving a classic feel, it will also be compatible with all Windows 7 (and possibly Windows XP and before) applications and services, meaning you can still use that old version of Adobe Photoshop right alongside the sleek new touch-based apps that will be available on the system. Unlike Android, which is rising from smartphone OS to slowly take on larger screens and devices, Windows 8 is Microsoft’s attempt to simplify and pare down its behemoth OS so that it works well on screens small and large. The true test of the OS will be how easily it can mimic the behavior of lighter smartphone operating systems. If it can’t attain or beat the long battery life, always-connected sleep mode, and wide app selection of Android and iOS, it may have a difficult time taking off. Let’s hope Microsoft has learned a thing or two since Windows Mobile arrived back in 2000. 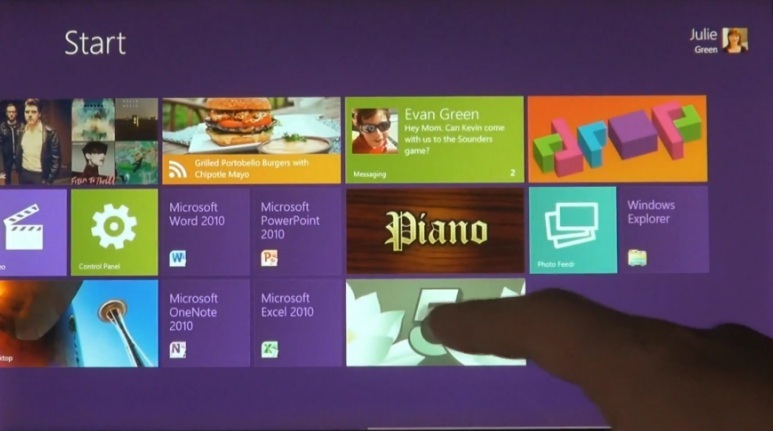 From what we’ve seen, Windows 8 looks like a bold and interesting step for the company. It will almost certainly launch with some innovative hardware attached to it. Microsoft made a point of showing tablet-like laptops running Windows 7 this past year at CES. We expect to see even crazier devices, many with keyboards, to debut in the months ahead, or perhaps at CES 2012 next January. Knowing it is under the gun, we hope that Google further builds up Android into an OS that can compete one-on-one with Windows. If Google enhances USB and wireless compatibility with devices like MP3 players, phones, and other computers, it will be well on its way toward meeting Microsoft head-on in the netbook and laptop space. Even a three-horse race would be preferable to the Apple-Microsoft duopoly we’ve been stuck with for 25 to 30 years now. For further proof of the impending collision of laptops and tablets, look no further than the Ultrabook, Intel’s best attempt at rekindling interest in low-cost laptops. These traditional Intel-powered Windows PCs are cheaper ($1000 or less), sleeker, thinner, lighter, more battery efficient, and have the ability to download email while in sleep mode. While these are all welcome advancements to the PC, they aren’t going to be enough to slow down the growth of ARM-powered smartphones and tablets. Intel chips don’t power most smartphone and tablet computers because of some poor strategic decisions the company made in mobile. Smartphones, tablets, and tablet-laptop hybrids are not going to destroy the Windows PC market in the next year. But all signs are pointing toward tablet computers becoming full alternatives to netbooks and other lightweight computers. They will not be able to match the intense processing power, multitasking capabilities, or hard drive space of traditional laptops and desktops, but they will quickly become the go-to choice for those on the move. As a writer, I’m looking for a laptop that is portable, enables me to write and do basic productivity tasks like printing, has enough processing power not to slow me down in a pinch, has enough memory to store some media and text files, gets fantastic battery life, and can connect to the net as fast and cheaply as possible. I’m guessing that many people want the same thing from a low-priced, portable computer. On my off time, I also like the idea of a tablet that lets me play Cut the Rope, check out a quick site, read some email, and watch Netflix. At the speed things are moving, I’m hopeful that within a year, I’ll be able to buy that device for $400-500 and walk away a happy geek. Competition breeds innovation, and the consumer electronics industry is more competitive than I’ve ever seen it. Anything could happen in the months ahead. In 2011 we’ve learned that Windows is not too old to undergo a radical change, smartphones can do just about anything, PCs can become tablets, phones can power laptops, and it can all be seen in 3D, if that’s your thing. Now we just need to pull it all together and shore up the oldest guy in the room. It’s time to bring the smartphone revolution to the PC.